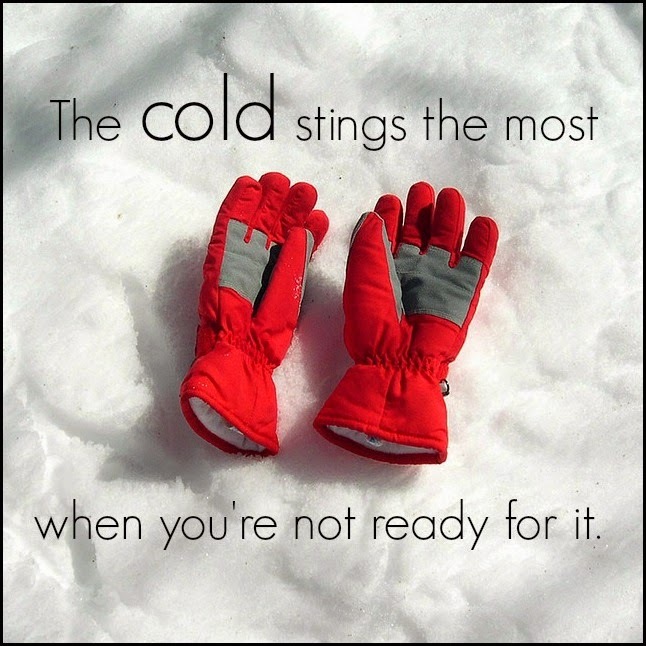 The cold stings the most when you're not ready for it. It's a bad habit, especially because the amount of time necessary to prepare myself is negligible compared to the amount of time I'll suffer the negative consequences of not preparing. Essentially, our family moved with the fluidity and speed of Randy from A Christmas Story. But we were warm -- so perfectly warm -- for the entire day. The cold didn't sting. We were prepared for it. I think of other storms I face -- not in weather, but in life -- and realize that a similar principle applies. We can learn to bundle ourselves, protecting our exposed nerves with layers of prayer, wisdom, and support from friends and family. We prepare ourselves and find that the storms don't sting as much when we're ready for them. Hi Robin! I agree that being as prepared as possible saves a boat-load of irritation later. There's so much in our worlds that happen without warning, why not be prepared for what I know is coming? I'm so glad you found your gloves! It's been very snowy and cold here, I can't imagine gripping that cold steering wheel...ugh.